Artist Point lies at the conclusion of Highway 542 just outside of Bellingham. Head east, as the local bumper stickers proclaim and the highway reaches its terminus high up on the northwestern edge of the Cascades. 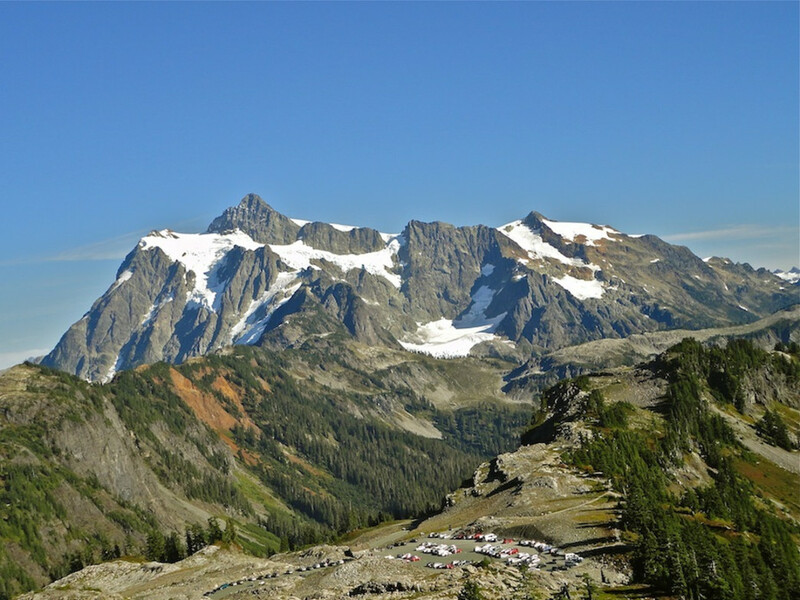 During the winter and snow-filled spring, the road can go no further than the Mount Baker Ski Resort’s upper lodge, and as such, Artist Point is left peacefully resting above, only accessible to backcountry skiers trudging up the slopes. But come late spring, summer, and into autumn, the cleared road extends an extra mile or so, and the mountain highway has a true ending. As you drive by the ski resort, you feel as if you’ve begun driving the legendary “Going-to-the-Sun” road of Glacier National Park, or even the switchbacked roads in the Italian Alps. The corners are sharp and the grade is steep, and on weekends, you'll find yourself among sport-car drivers and motorcyclists hugging the bend. But once at the top, you’re in hiking paradise. These trails are only cleared from the snow for four or five months of the year, and there’s no better time to get up there than right now. The parking lot at the top is huge, and requires a Northwest Forest Pass, but considering all it accommodates: a bundle of trails for hikers, a sightseeing and photography hotspot, and an Alps-esque mountain road for the driving sort, it's well worth acquiring. Here are the five ways to hike out of Artist Point. Get up high for the 360º panoramic views. Only a 3-mile roundtrip hike, you gain nearly 600 feet in elevation as you climb up to 5700 feet above sea level. 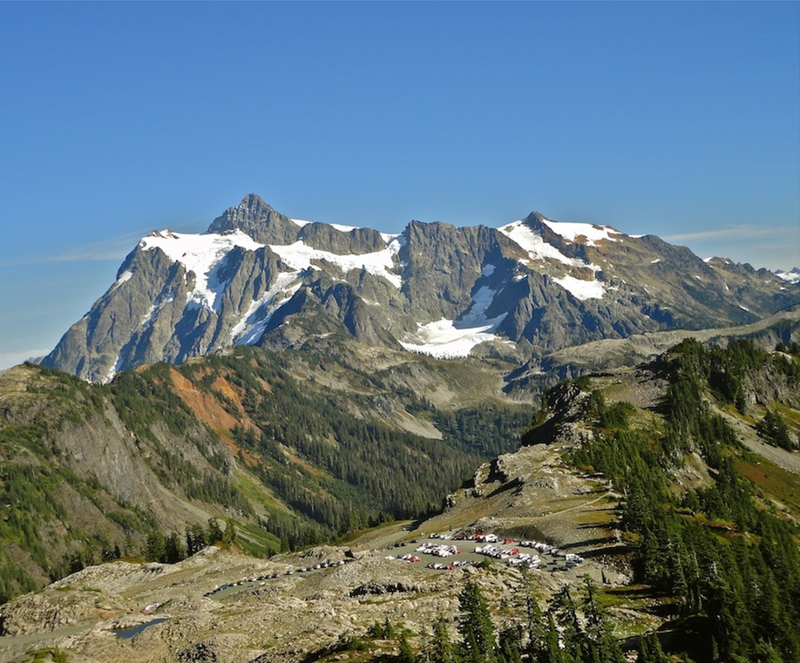 This table-topped mountain is the perfect spot for a picnic, and has clear shots of the Cascade mountain classics: Baker, Shuksan, Goat, Glacier, Ruth. You can even gaze out at the towering American/Canadian border peak, pondering on whether this is the most beautiful edge between two countries. The route is rocky, but the switch-backing trail is well laid out and maintained. This is one of the more popular trails out of Artist Point, and well worth the short hike up. Spend some time exploring the large top (without getting too close to the edges) and take in the view in all directions. This 8-mile loop is another favorite. While some begin the loop at the bottom, near the resort, it’s common to start and end at Artist Point. From the parking lot, take the Chain Lakes Trail as it splits away from the Table Mountain Trail. The path wraps itself around the towering feature and splits between another ridgeline as it drops down into the lakes. 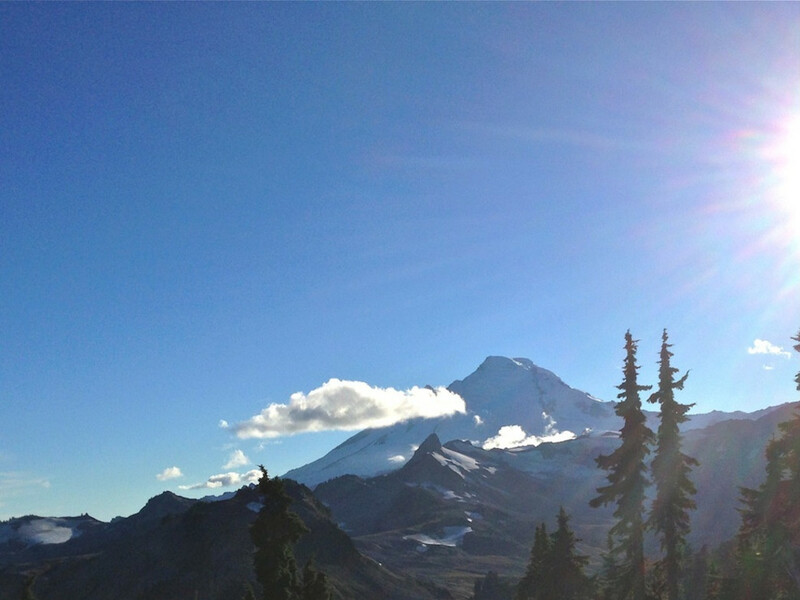 Stop here to ogle up at Mount Baker, basking in sun. A small trail takes you by a few lakes, until you find yourself at the third lake, looking up at the saddle above. Leave Icicle Lake and ascend up to Herman Saddle. This has you looking down into the bright green meadow, or up at the distant people on top of Table Mountain, or even off at the towering Shuksan looming in the background. From there, you have an easy descent down the trail and through the valley, popping out into an overflow parking lot. 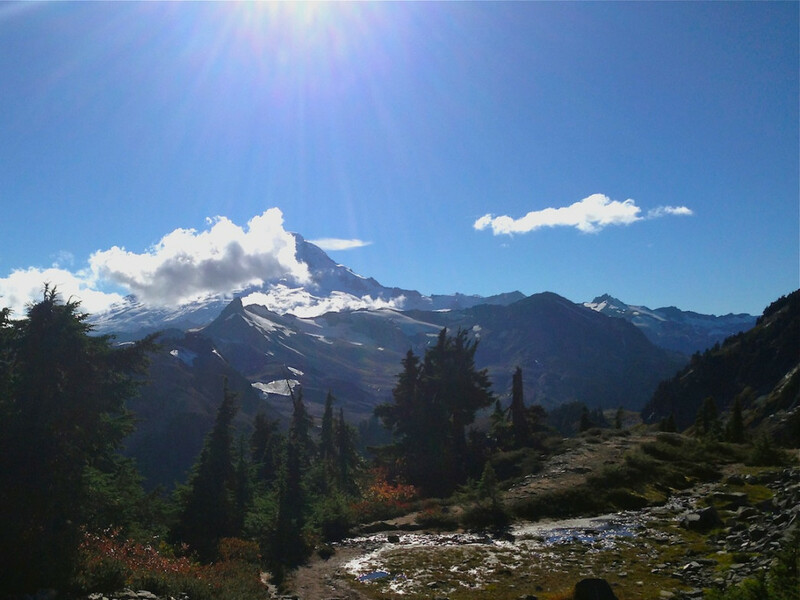 Pick out the Wild Goose Trail and make your way back up to Artist Point. All in all, you gain 1700 feet of elevation, your highest point being about 5400 feet above sea level. This 10 mile out-and-back trail inches you closer and closer to the snow-covered Baker. The ground will be rocky, but the ridgeline hiking is a can’t miss adventure, and much quieter than the Chain Lakes and Table Mountain. 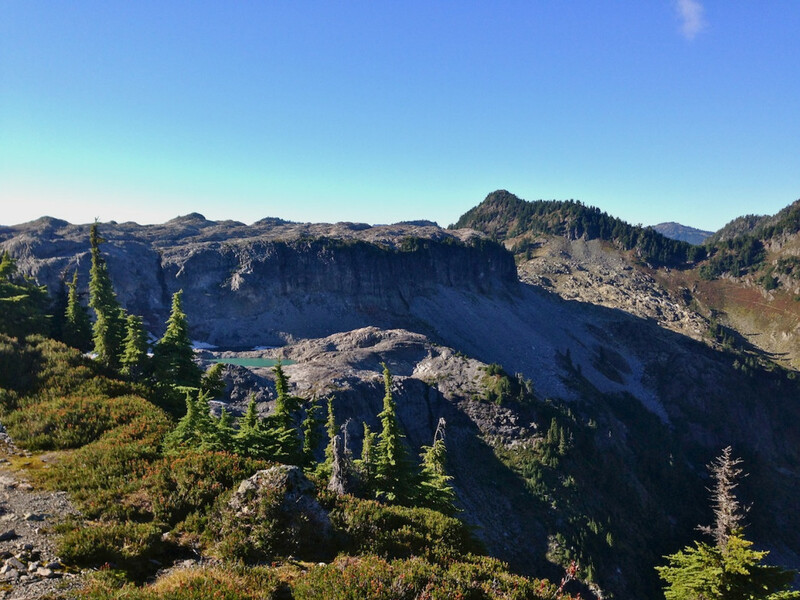 From Artist Point, head out towards the Chain Lakes for just over a mile, before hopping onto the rugged path heading into the heart of the volcano. You’ll pass through a meadow here and there, but you’ll mostly find yourself hiking with the gentle fade of slopes to either side. After 5 miles — and a gain of 1300 feet — you’ll reach a campground, the end of the road for day hikers. Feel free to stay overnight if you’ve got the gear. You’re sitting at 6200 feet above the ocean, right on the toes of Baker. Not a bad place to be. While the three previous trails take you closer to the taller Baker, the Lake Ann Trail takes you to the base of the mean looking Shuksan. But don’t let looks deceive you - there is nothing difficult about this hike. You gain 1900 feet in the roughly 8 mile out-and-back adventure, but a lot of that is on the return trip. The trailhead is actually just beneath the Artist Point parking lot, so you can choose to park there or at the top, a short distance away. In a testament to how close you are to the soul of Shuksan, the loud thunder of glacier activity has been known to wake up Lake Ann campers. For more on Lake Ann, read our Insider’s Guide to the 542. While not technically a trailhead stemming from the palm of Artist Point, this collection would feel incomplete without mention of this tiny 2-mile trail. The meadow between Table Mountain and the Herman Saddle (Chain Lakes Trail) is draped in wildflowers and petite lakes. Perfect for a short day with the young kids. Park in the overflow/backcountry parking lot by the ski resort and follow the signed trail into the valley. Meander around for an hour or so, crossing a small stone bridge and dipping into the ice-cold water if you are brave enough. 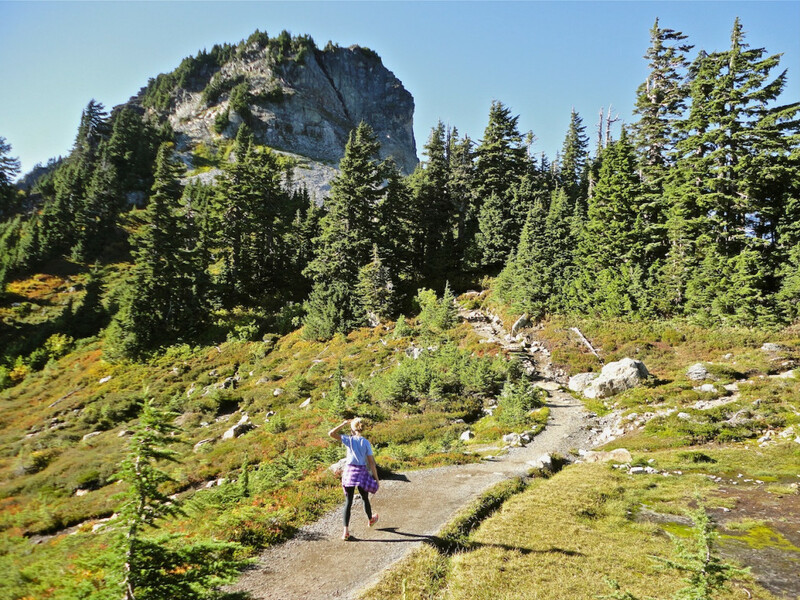 As you stare up at the mountains around you, Bagley Lakes is the ideal introduction to the Northwest Cascades for your new-to-hiking young ones.